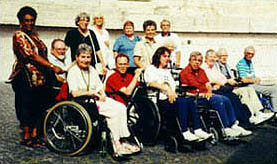 Our Experience with Group Travel: This past July we ran a 12 day accessible tour of Italy with Nautilus Tours & Cruises with 15 participants, custom-designed for our traveler's needs and interests.Participants stayed in 3 & 4 star hotels located in the downtown historical centers of the cities of Rome, Florence and Abano Terme. The tour visited such places as the Vatican and the Borghese Gallery in Rome, the Uffizi and the David in Florence, the Leaning Tower in Pisa and San Marco Square in Venice. 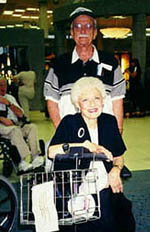 They dined in some of the most famous restaurants in Italy and traveled with an accessible coxch bus. "We wish to thank you from the bottom of our hearts for such a nice experience in Italy.Our favorite stop was in Florence. We made a purchase at the Gold Store you recommended. The people there were most helpful and hospitable. We will always have fond memories of Italy and you." ".the tour was GREAT and you did a wonderful job. I am very impressed with Regency and I appreciated the time you took with the group.that amazing meal the last night in Rome... I was delighted by the access in Venice.the wheelchair lifts on the boats worked very well and everyone was delighted. I'd say the tour was a success!" Our Experience with Individual Travel: Our staff has studied every location, service & hotel requested by each individual traveler visiting Italy. Each were given on-the-spot investigating in order to correctly study them. For example, a family of 4 wanted to travel the Orient Express and Eurostar throughout Italy. One of the family members was in a wheelchair and needed accessible accommodations. Regency went to observe the train first-hand to find that it is not only accessible but special arrangements can be made for wheelchair assistance. We were able to advise the traveler of exactly what compartment of the train she should stay in and help her understand that Italy is more accessible than you think! Last January, a Japanese firm Manager was visiting Italy for business and suddenly needed to do a dialysis. It was an unexpected situation for him: he supposed to need it once back to Japan. But there can always be a contingency. He applied to Accessible Italy Dept to get help and we immediately arranged this special service for him. This situation occured in Florence, and we could immediately answer to his request of help. Our availability is to find help for this kind of need in other main cities of Italy. Just contact us: the solution will be found!